A New Home on the Road! When I decided it was time to retire and sell the house, I knew that I wanted to travel and see the U.S.A. Since the early 1990's it has been a dream of mine to travel the US by RV. When the time came to actually do it, I had lots of ideas about the type of vehicle I would actually travel in. For a while, I thought I'd build a tiny home and get myself a big pickup truck to pull it. Then I thought I might get a good sized RV. Then a small one. For a while I thought I would purchase a cargo van and convert it. Then I became enamored of some tiny handmade Japanese trailers (which I still would love to try building myself). But reality set in that building or converting something wasn't very practical for me at this time. I didn't have the space nor the physical capability. 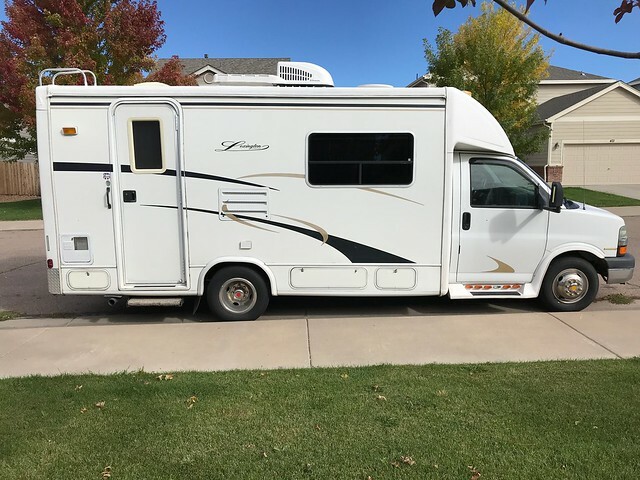 Purchasing a new RV was out of the question and after looking at many of them, I realized I didn't want to drive a huge one. So I've been looking for a used one that would fit my needs. 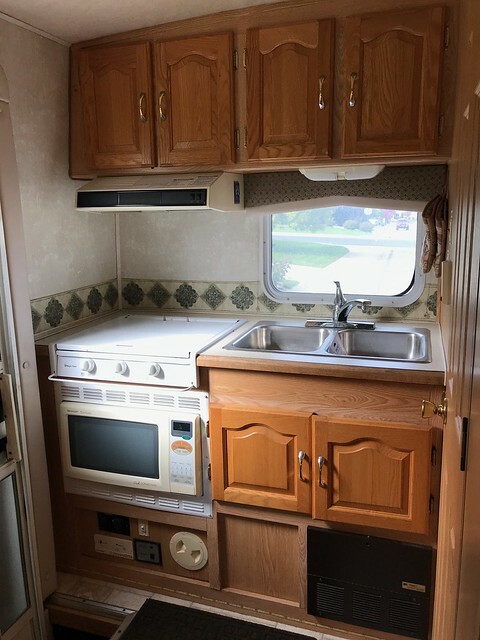 It had to have a dedicated table and chair, a dedicated bed, a functional bathroom, and kitchen area, and mostly, it needed to be 24 feet long or less to facilitate driving, parking, and camping in National Parks. It would be a bonus if it was fairly well insulated and if the holding tanks were heated. The vast majority of small RVs had sofa beds that needed to be made up each night, or involved climbing up to a tiny space over the cab. Very few were well insulated and truthfully, most that I looked at were poorly made and would have needed much work right away, even when new. Plus, they were ALL brown and ugly inside. Yuck! Then one day while searching, I expanded my search nationwide and at last I found exactly what I was looking for - in Ohio! After a sleepless night of thinking about it, I looked up the Car-Fax on it, called the dealer, booked a plane ticket for later that same day. My daughter in law drove me to the airport and I arrived in Detroit at 2:00 a.m.! After a brief night's sleep at a motel, I rented a car the next morning and drove to the dealer and spent the better part of the day inspecting the RV, test driving it, then doing it all over again, all the while asking a gazillion questions. I decided I needed to sleep on the decision, but woke the following day knowing she (the RV is definitely a "she", though her name isn't fully decided upon yet!) 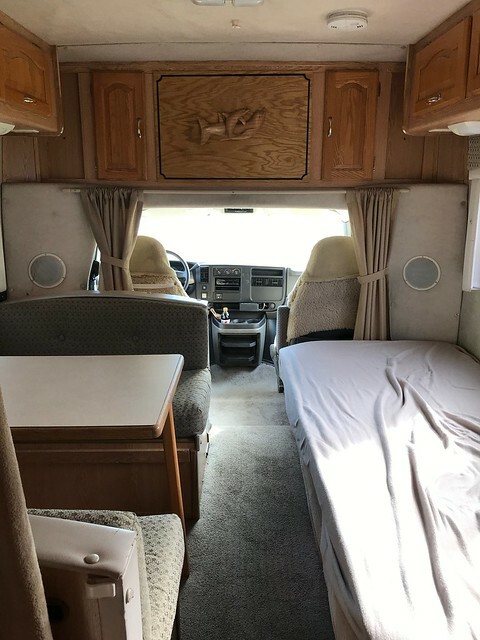 was going to be my new home on the road! The dealer was great and even helped me return my rental car to Fort Wayne, Indiana, about an hour away from the dealer. 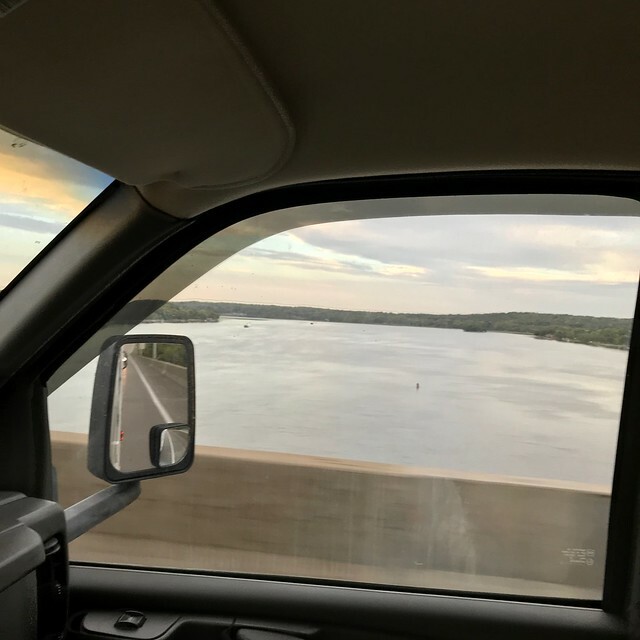 I got to follow along behind my new RV and see how she looked from behind! 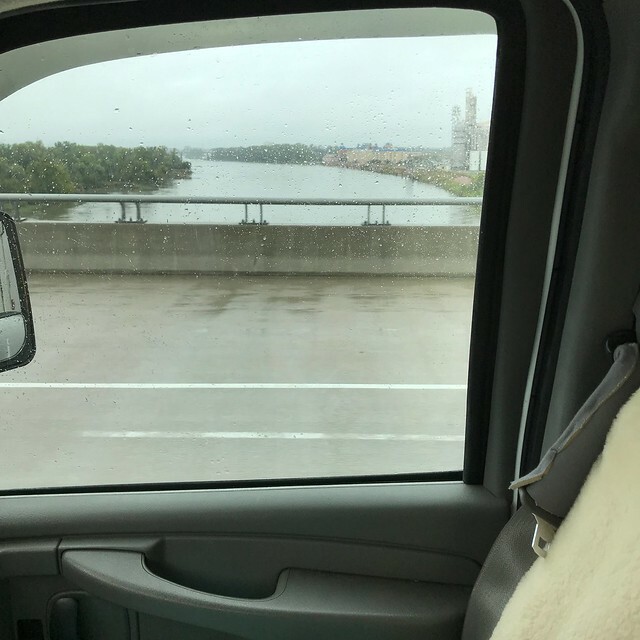 and we crossed the Missouri River in the rain. Got pulled over in Omaha, as evidently I looked "suspicious" driving an RV with temporary Ohio tags. Had to show him my registration and sales paperwork to prove I was the legitimate owner. Thankfully, that was the biggest excitement of the journey! While driving, I felt like I was driving a huge rig, but parking next to a semi put everything into perspective! She's about 23 to 24 feet long ~ big enough! We arrived home in Colorado late the second day. Two long days of driving gave me lots of practice! Hopefully, there won't be too many long hauls like that in our future. So here's a look at her. 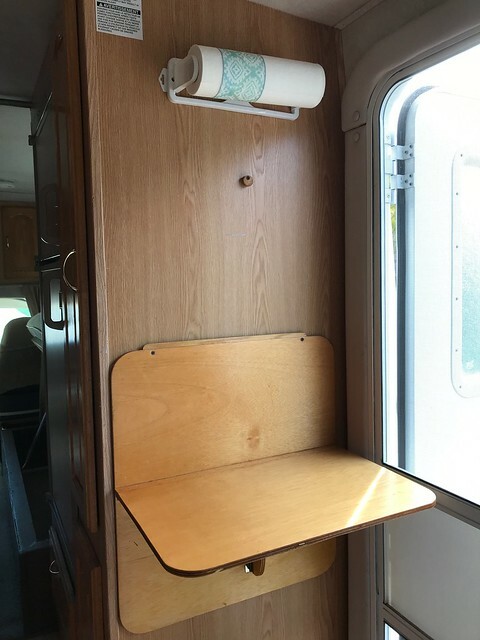 She has comfortable bench seats at the table with plenty of room to spread out a stitching project or some watercolor painting. The sofa has been replaced with a single bed with lots of storage underneath. Behind that dolphin panel is a TV and DVD player and more storage. The dolphins have to go... not quite my taste! 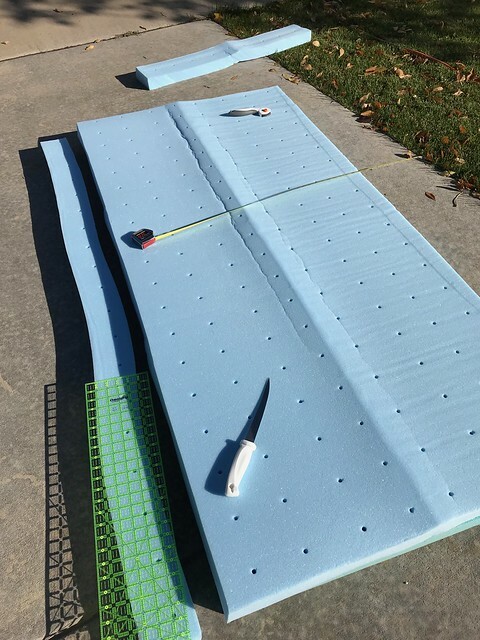 One of the first things I did when getting her home to Colorado was to discard the old foam topper and replace it with a new memory foam topper. I also discarded several brown fleece covers and "drapes"! The bed is slightly smaller to fit the space, so I got out my quilting ruler and a sharp knife and adjusted the topper accordingly! 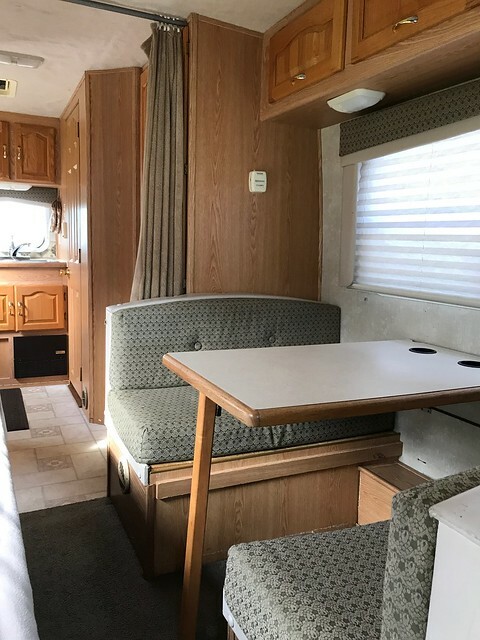 Compared to most of the RVs that I looked at, this one has nice quiet colors and a subtle print. Much better than some of the wild stuff I've seen! Though the kitchen is small, it's quite functional and the microwave is also a convection oven! I will miss my toaster oven though. 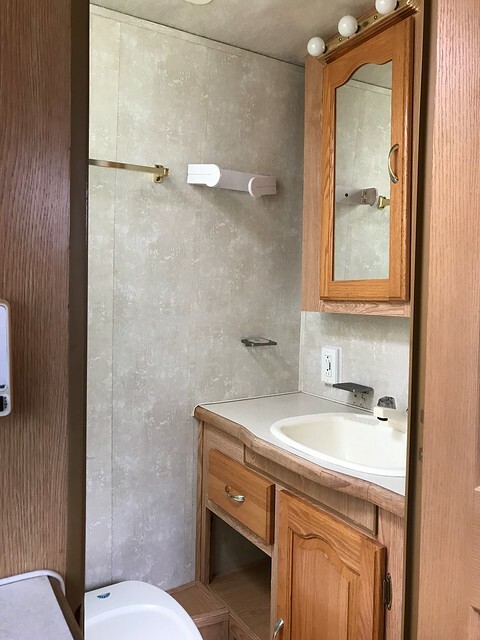 The bathroom is a nice size for a small RV! 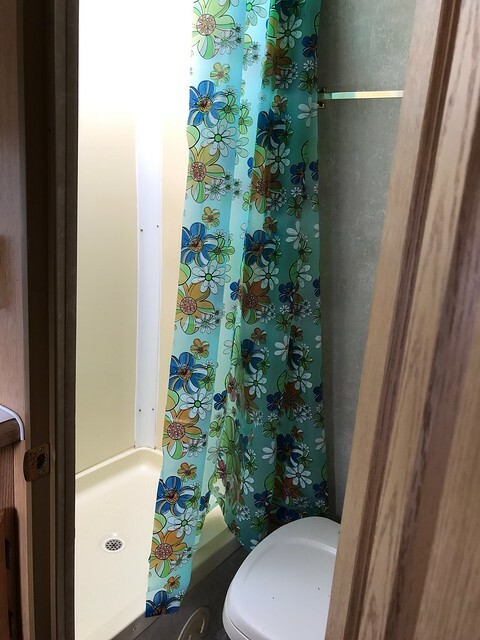 The 1970's looking psychedelic shower curtain has to go though! There's a good size closet and a set of drawers. 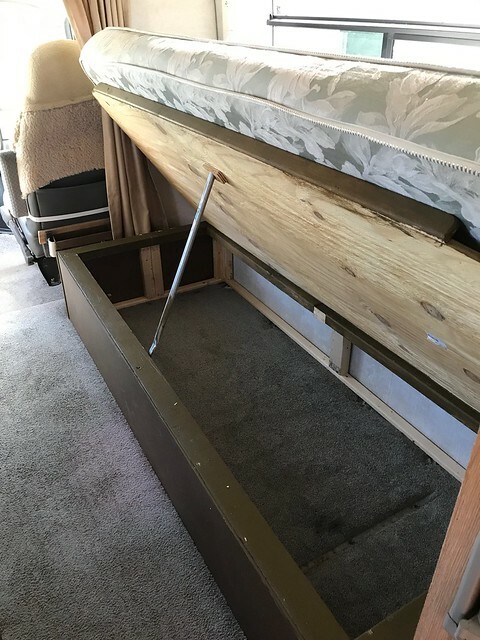 Lots of storage under the bed for stitching and art supplies! There is a nifty little fold out counter in the doorway of the kitchen area. Next to the refrigerator, there is a nice pantry cupboard space. There are a few planned updates, such as a coat of white paint on the interior. Some new linen slipcovers on the cushions, hopefully some new flooring at some point and other personal touches! 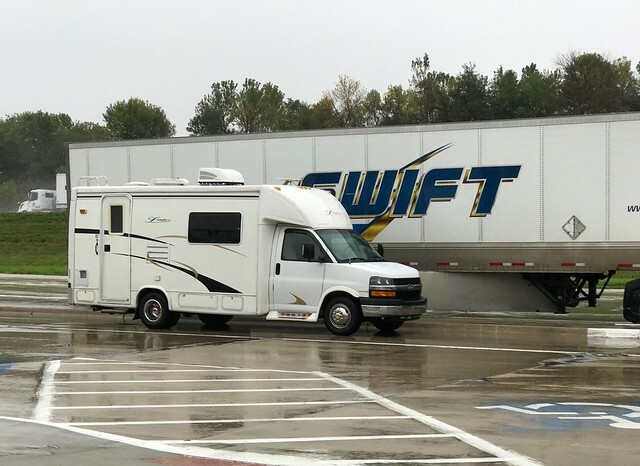 I think she's going to make a fine home on the road! Congrats to you on your little home on wheels. I look forward to seeing 'her' all spruced up in your style. She'll be lovely. 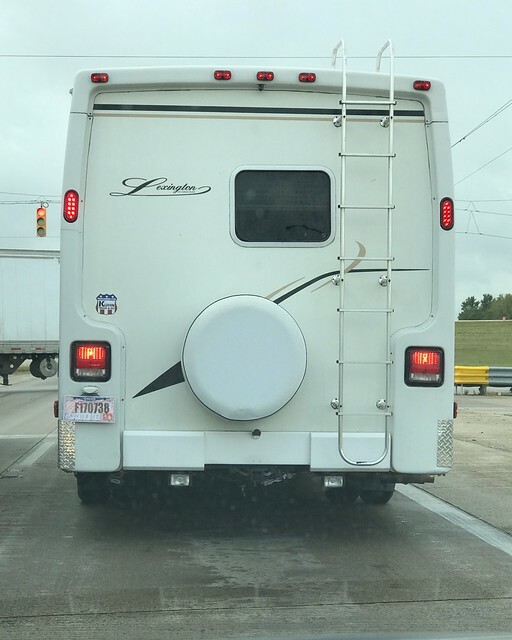 I had to zoom in to see what company made your RV since I live in the World Capital of RV Manufacturers. Both my daughter and grandson work at Forrest River. Your unit looks to be the perfect size. I'm so glad you got to start living your retirement dream. So many of us think we will be able to do that, but poor health nips our dreams in the bud. Welcome to "livin' the good life". We drove from California to Florida to pick up our new 5th wheel in July. We have been living as full timers ever since. I have no regrets of selling our home and contents. I have a dedicated stitching area as well. I pray safety over you and your home on wheels! You are one adventurous lady! Looks like it will fit the bill for a cozy home! Congratulations Lisa! I can't wait to read all about all of your adventures. Best wishes and Happy RVing. 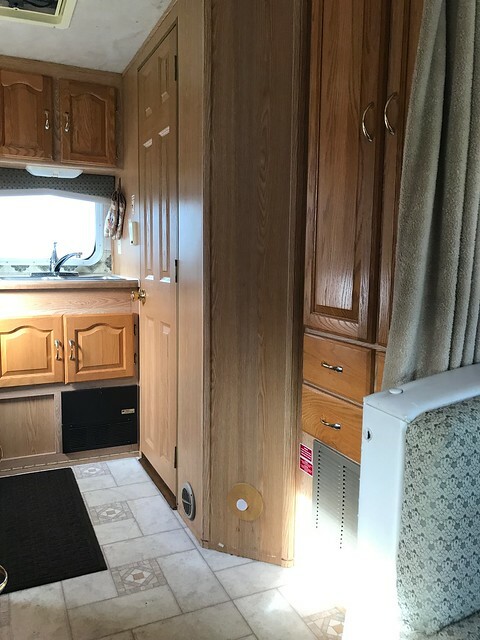 Congratulations on a good RV for your new life. I hadn't thought of painting the interior. That will be an improvement. Hope to see photos sometime. Enjoy! I'm very interested to hear how you like travelling with this unit. I'm planning to retire in two years and I have been thinking about all the same options including bowler trailers. Wondering what you will discover with this size vehicle. Good luck and enjoy your adventures. Congratulations on your new home! Enjoy! 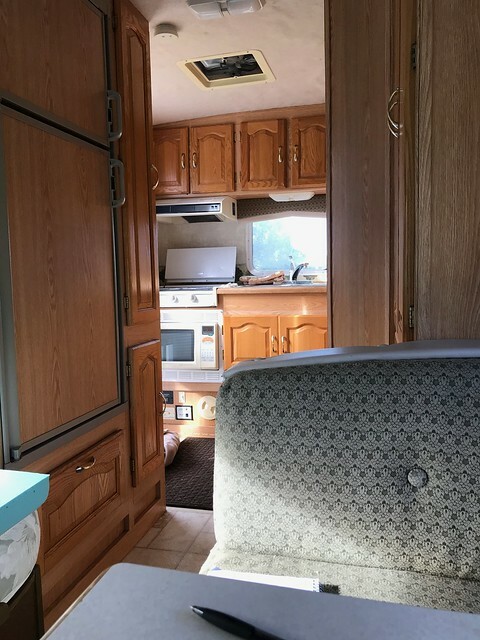 I was so glad to come to your site and find photos of the interior or your RV. It's a great buy, Lisa, and just the right size. Ours is the same length, easy to park in main streets and on sites. You have great ideas for making it seem just yours and I wish you lots of happy adventures in it. It's a wonderful life! I have been following your blog for several years now and I love how you are able - and brave enough - to fulfill your dreams. 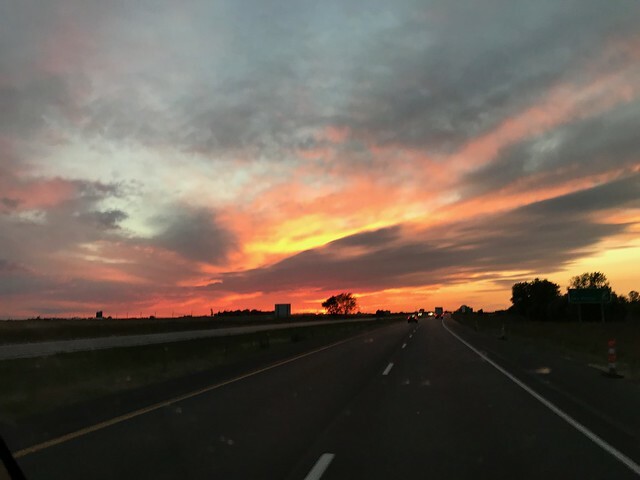 Best wishes on the road ahead. I have just one question. What did you do with your cats?